Rick Pitino will coach in the EuroLeague playoffs for the first time in his career. Panathinaikos head coach Rick Pitino hasn’t participated in a playoffs series since 1989 and his stint with the New York Knicks. This doesn’t mean though that he feels any weird ahead of his return to postseason clashes and the first EuroLeague playoffs series of his career. Against reigning champion Real Madrid, no less. “After coaching in seven Final Fours and 50 million people watching, I think I can handle it. Also, we played against Larry Bird, Kevin McHale, Robert Parish, Charles Barkley in the playoffs. 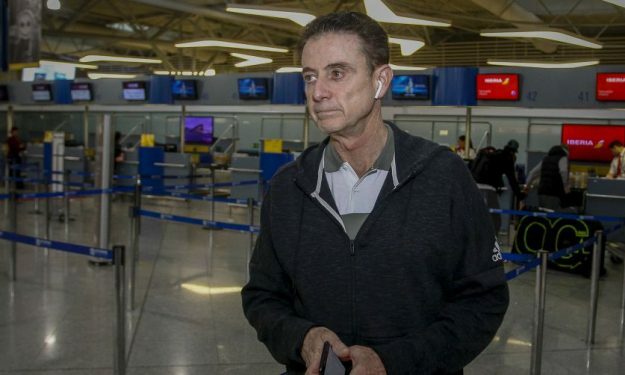 So I think I can handle it,” Pitino said to Greek TV channel Nova Sports from the Athens Airport, just before boarding for Madrid. “And we swept the Philadelphia 76ers. With Barkley,” Pitino also mentioned. Pitino’s Knicks beat the Sixers 3-0 in the Eastern Conference first-round series of 1989. They lost 4-2 to Michael Jordan’s Chicago Bulls in the semifinals. Panathinaikos and Pitino are facing Real Madrid twice in Spain in Games 1 and 2 of the best-of-five quarterfinal series. As Pitino confirmed, James Gist, one of Panathinaikos main players, may miss the first two games of the series.